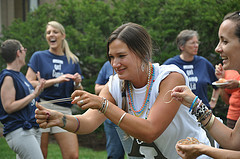 This year, nine teams competed in the College of the Liberal Arts Office Olympics to benefit the United Way. It was an afternoon full of fun and friendly competition, and on behalf of the entire United Way Committee I want to thank everyone for their support of the event. I am pleased to announce that we shattered our previous fundraising total and were able to donate $7,952 back to our local community (last year’s total was $5,500)!!! Team Moore United (Psychology Department) was crowned the 2013 Office Olympics Champion after raising $3,606! Congratulations on your outstanding achievement! It was a tight race for the fundraising title as Luellen’s Pirates (Alumni and Development) came in a very close second at $3,235. I also want to thank every department for the fundraising contributions each was able to make as every dollar matters and will positively impact the lives of those living in Centre County! If you want to get a jump start on fundraising for the 2014 Office Olympics you can get started at any time. Ice cream Is Served ~ 2:00–4:00 p.m.
Office Olympics Ceremonies and Games ~ 3:00–4:30 p.m.
All proceeds benefit Centre County United Way. Following the success of the Office Olympics last year (we raised over $5,000) the United Way Committee has decided to once again put on the event! We are hoping to get even more units involved and increase our fundraising tally so we thank you in advance for any and all support you lend to making this event great! Even though we are months away from the actual Olympics I wanted to provide you with some basic information. Date: Please mark your calendars for Tuesday, August 13th (rain date of Thursday, August 15th). Time: Arrival time of 2:30. The event will wrap at 4:30. 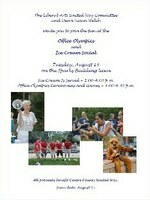 The Dean has also generously agreed to hold an ice cream social during this time frame. Team Registration: Teams will consist of five people and you can have one alternate (staff, faculty and students are more than welcome to participate if you need help in rounding out a full team). You can officially register your group by emailing Amanda Goble (amg283@psu.edu) with the names of your team members (please designate a captain) and your team name any time before Friday, June 14th. Do not worry if you don’t have all team members confirmed by June 14th as you can simply sign-up your team and juggle the members as necessary up until event day. A $50 registration fee is required per team. If you only have one or two people interested please let us know and we can look to pair you up with other like groups. Fundraising: This event is a great opportunity to enjoy an afternoon of friendly competition with your colleagues in the College. It also serves as one of the biggest fundraising events we do throughout the year. We encourage each team to raise as much as possible leading up to the closing ceremonies and a trophy will be presented to the team with the highest total. You can start fundraising immediately. Please turn in your money, with your team name on the envelope, to either myself or Sherri Bumbarger. Games: We will have some old favorites as well as some new ones. Volunteers: We need them! If you aren’t interested in being part of a team but want to be involved we would love your help. Please email me if you want more details. Costumes/Uniforms Not Required: There will not be prizes for best costumers this year. Your team is more than welcome to be as creative as you wish but we wanted to avoid adding things that would cost teams additional money. On behalf of the entire United Way Committee we would like to thank all of you in advance for your support! Flash back to the 2012 Office Olympics!